Christian Louboutin's designs for 3.1 Phillip Lim featured details galore: layered kilties, grommets, tassels and buckles. There was supple suede, metallic leather, luxe velvet and contrasting combinations of textures. The forest green peep toes with the double ankle strap were my personal favorites. I see them with fishnets and plaid skirts... not too short, but also somewhat playful. Calvin Klein took more of a pared down, but toughened-up approach. Simple mary janes and ankle boots got the urban warrior treatment with metal platforms and lug soles. During the winter, it's often difficult to find footwear that's both chic and durable. For Fall 2010, Calvin will be my go-to guy. These ankle boots will look great with a pencil skirt/ dress and opaque tights or a pair of cropped skinny pants. Opulent accents with pops of deep red and mustard ruled the Carolina Herrera runway. Her shoes were demure and decadently decorated with 3-D sueded jewels. They're so serious that there's almost something fun about them. However, they should only be worn with the most ladylike of attire. The mustard/ deep red combination in the pair pictured called out to me. They could easily be the focal point of an ensemble, requiring only a simple shift dress to complement them. It was all about exotic skins and metallic leather treatments at Donna Karan. However, she kept things simple, showing ankle boots, updated mary janes and sandals in varying shades of black, bronze and gray with elastic gore detailing. 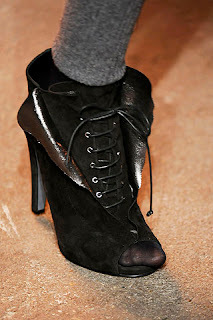 I'm most likely to wear the ostrich ankle boots with patent and elastic side gore shown here. They're simple and versatile, but the ostrich leather luxes them up, and the stilt-height heel is right up my alley. A favorite among the swank set, Oscar de la Renta opted for a color palette of regal purple, gold, red, deep blue and teal. The clothes were a nod to the "Dynasty" days, but the shoes were timeless. Tassels, jeweled embellishments and straps accented classic platform pumps, knee boots and ankle boots. The funkiest look was probably a pair of purple suede platform pumps with copper piping and back tassels affixed to a copper strip. They're definitely not a "wear with everything" pair, but they'll add a royal touch to a skirt suit or pants look. Those sparkly tights are a winner too! 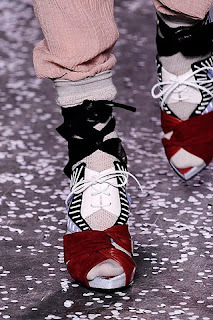 Rodarte went a bit wacky, combining textures, fabrics, colors and styles into a fashion hodge podge that somehow worked amazigly, and Nicholas Kirkwood's shoes for the collection were a veritable icing on the chaotic cake. Oxfords with sandal toes, ankle wraps and heels that resemble melted wax may sound a bit odd. But I was in love at first glance. Shoes like these aren't for the faint of foot (or fashion), though. They're best worn with an abundant dose of confidence and an outfit that says "I care not what you think..."
Fur, calf hair and suede on peep toes, ankle boots, wedge pumps and ankle strap heels made Thakoon's show a game of hide and seek. In some instances fox fur peeked from inside a peep toe, lace up bootie. In others, calf hair wedge pumps were accented by a puff of fur at the toe. 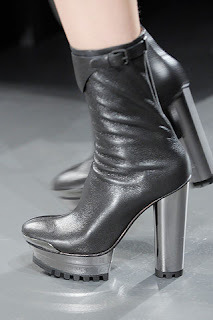 I can see myself in the peep toe booties with the metallic underlay. They're simple enough to go with almost anything, but the metallic accent adds a unique touch. Stay tuned for my picks from London, Paris and Milan! In the meantime, what were some of your favorites from New York Fashion Week? Who's designs totally turned you off?